Are you ready for a dolphin watching experience from Port de Pollensa? There is now a tour to search for dolphins in their natural habitat aboard a sailing catamaran, to get panoramic views of the Formentor Peminsula along the way and to see the sunset in Port de Pollensa. 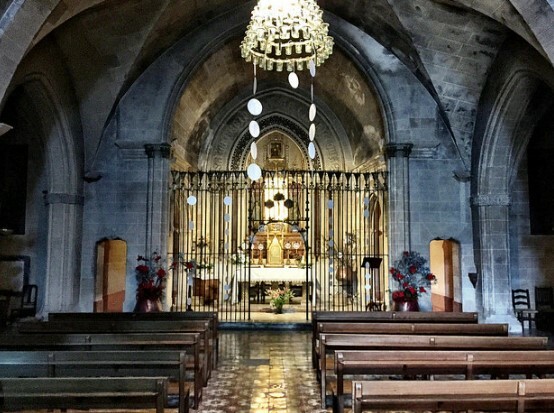 Today we have a classic walking tour and well known Mallorca, which leads from the religious centre of Mallorca, the Sanctuary of Lluc, to the lovely town of Pollensa. We put on the boots and start! 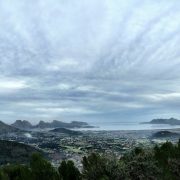 Today we have a new walk in Port de Pollensa in Mallorca that will take us to a small top well known by the people of Pollensa, combining history, sights and beautiful natural surroundings. We’re going to walk to the Puig de Maria in Pollensa. 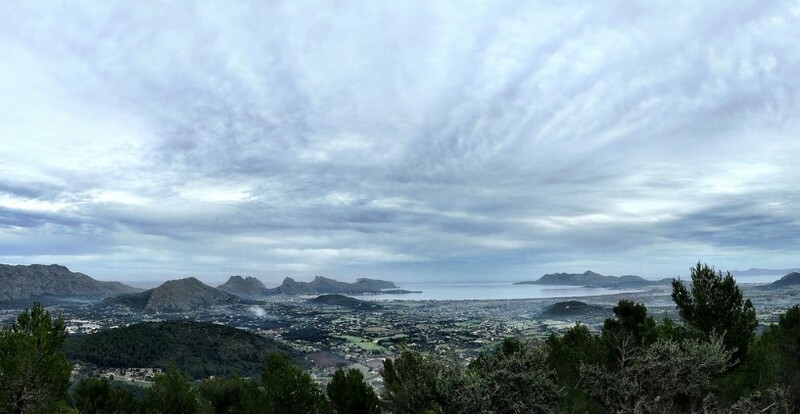 The walk takes us to a place rich in history, the Puig de Maria, in front of the beautiful town of Pollensa, and is a rather steep climb, but nice, whose final destination is well worth it. We are going to explain you how the tour is, what we can do and some helpful tips to make the most of this walk, along with some photos that for sure you will like, and inspire you to do this tour. How long is the walk? 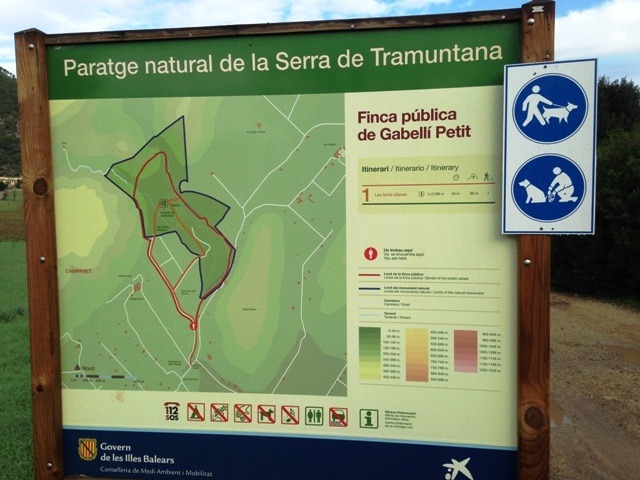 In just one hour we are going to be at the Puig de Maria, one hour to walk up. The walk down is in just 40 minutes. To this we add the time you decide to spend there, because there are many things we can do. The walk is about 3 km and 300 meters ascent. With children or without? Ideal with children, because it is a short climb to well-defined way and mostly asphalt. Also, as always commented, children go up anywhere and 100 times faster than adults. Where to park? The tour starts at kilometre 51.9 of the M2200 road, next to the town of Pollensa, where we see an indicator of wood that shows us the path to the Puig de Maria. We can park either there or nearby smoothly. Tips for the tour? In the Puig de Maria there is a restaurant that offers good food at great prices, there is a hostel so we can sleep there at reasonable prices and there is a playground where you can make your own bbq. So it will not be by choice and if you give free rein to the imagination, why do not go in summer with full moon, eat in the restaurant, watch the beautiful views of the Bay of Pollensa, and the stars, then down back, or stay overnight in the Puig de Maria. Why we like this tour at Puig de Maria in Pollensa? Because as mentioned just above, there are many options at the Puig de Maria which can make this tour an all-day activity, a few hours or half day. It is an easy, affordable for all and with exceptional views excursion. 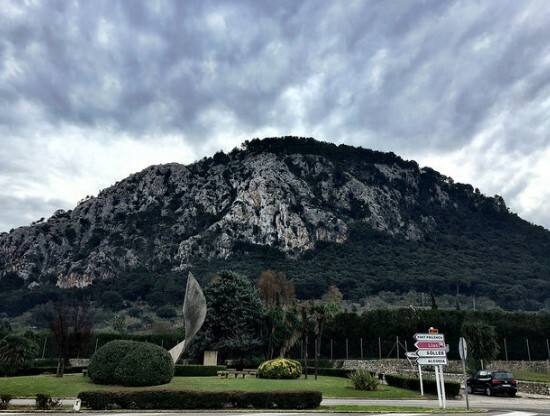 We start our trip to the Puig de Maria, whose name comes from the Arabic word “al-mariyat” meaning “see” “look” very possibly related to views that await us at the top. It is also known as Puig de Pollensa or “Senyora nostra” Puig. On the way you´ll find a dense forest of oaks. In the bushes we can see strawberries, sarsaparilla or cirerets of betlem which are red fruits. During this part of the tour, we will see some shortcuts (sharper than the road itself), but it is better to continue on the asphalt road to preserve the forest of oaks. And if you are tired, you will find some wooden benches to have a brief rest. The current paved road was built in the 70s, replacing the old road des Puig. After about 30 minutes, we reach the paved road dating back to the 17th century and which following the technique of “dry stone” was rehabilitated in 1994 by “margers” of Insular Consell de Mallorca and take us to the top of Puig de Maria. Before beginning, we find the Cova del Dimoni and a small cavity in the rock known as the Cadireta (little chair) of Bon Jesus, the legend says that pregnant women who feel the baby in it will have a happy birth. 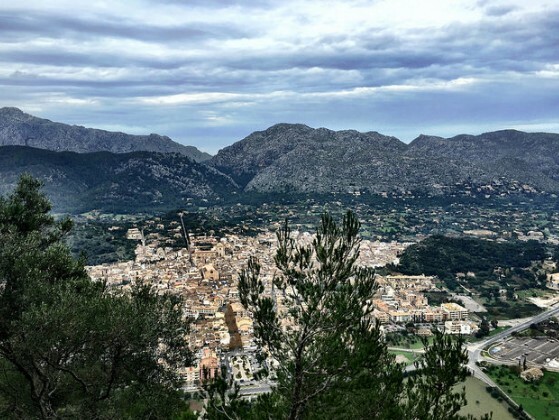 Next, on our left, emerges the path of the Ermitans, built in the early 20th century, which offers spectacular views of the town of Pollensa, where we can distinguish three churches in the town and the main square or the path to Calvari . 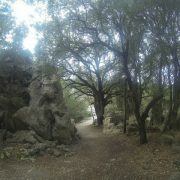 The trail leads to the Clot de la Mare de Deu, on the right side, the pit where tradition says the image of the Virgen del Puig was found. And from the above we head slight rise to the top of Puig de Maria where we find, first, the torrada area with benches and chairs with spectacular views of the Bay of Pollensa. Then we will see the ancient defensive tower of the 15th century, because in case of danger or attack by pirates, the inhabitants of Pollensa ran there for refuge, not to Castell del Rei as many people think. We also see canvas battlements, very well preserved, where we can find geocaching . Beside the defensive tower is an arch that leads to a spacious terrace, where we find the oratory. It was in 1348 when the construction of a chapel was authorized and then a few years later a community of nuns was installed in the monastery rose. There is a restaurant for those who bring their own picnic and prefer to eat inside the house. There is a wood stove for those willing to use it. There is a BBQ area outside for those who want to prepare their own flesh, and in the shelter sell firewood and charcoal. There is an area of ​​accommodation with rooms for 2 people up to 8 people.For instance, the price of a cell of 2 people is 24 € (sheets included). Do you need more information about walks in Puerto Pollensa? The Nofrills office offers you loads of excursions and local information, as well as suggestions for walks in Puerto Pollensa ! Come to see us while you are in Puerto Pollensa!